Hermann, Mo. 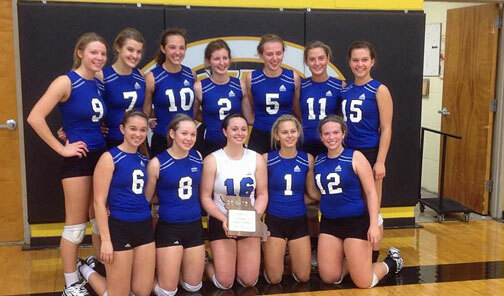 - The Hermann Lady Bearcats (23-13) are headed to the Missouri State Volleyball Final Four for an unprecedented 21st time after defeating Lutheran St. Peters 25-21, 25-21 in Saturday afternoon’s State Quarterfinals on their home court. Hermann’s senior Jamie Glesson smashed a game high 14 kills but it was Kirsten Leimkuehler’s “killer” career high 11 kills on just 14 attempts and Sydnee Pate’s season high four aces that propelled the Lady Bearcats to their eighth straight win and a trip to the Show-Me Center. New Haven, Mo. - The New Haven Lady Shamrocks (23-11, 6-1) finished second in the Four Rivers Conference (FRC) behind Hermann, (7-0) who won their 18th conference title. 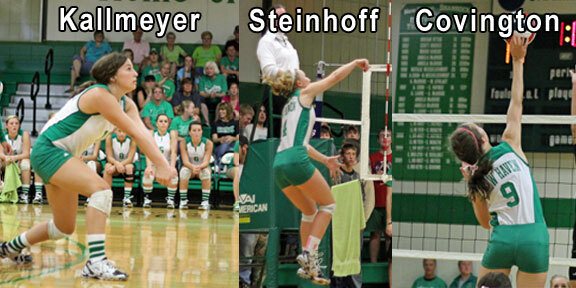 New Haven was the only school with three players voted 1st Team All-Conference; seniors Rachel Steinhoff and Emily Kallmeyer, and junior Taylor Covington. 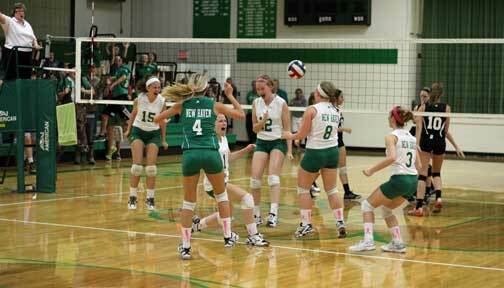 Shamrocks fall to Valle Catholic in two sets 25-20, 25-22. 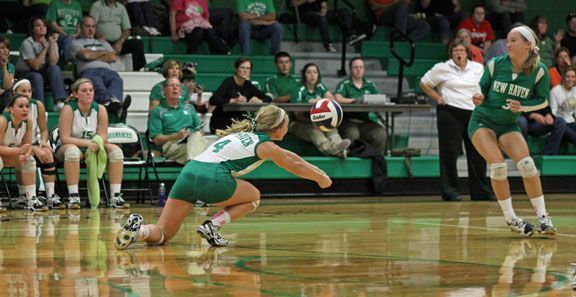 In her last home volleyball game, senior Rachel Steinhoff had probably her best performance on the year by making diving plays similar to the photo above. New Haven, Mo. - The New Haven Lady Shamrocks (22-10) end their regular season with a big win as they out battled Owensville to win in three sets (25-14, 22-25, 25-16) and head into Districts on a six game winning streak. 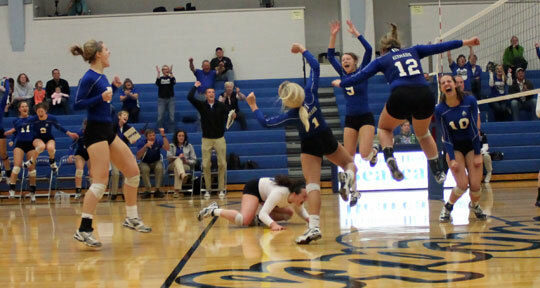 “Winning Tuesday night in a hard fought match was defiantly a positive as we head in districts,” Coach Jaime Hoener said. 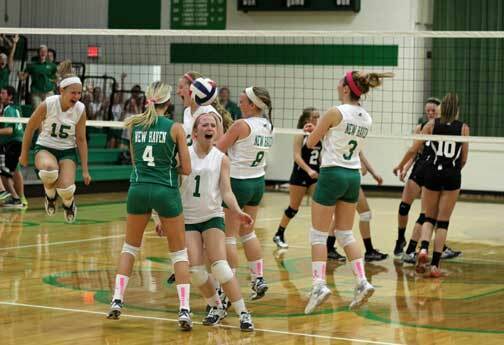 Tuesday night, with New Haven’s Junior Varsity Volleyball team’s two set win over Owensville, the “El Perfecto” season became a reality, finishing flawless (24-0, 7-0) and winning the Four Rivers Conference title for the third straight year. On the year, New Haven outscored their opponents 1,276 to 713, losing just three sets while winning 49 sets, winning both the Lynn and Pacific tournaments. In the past two years, Carey’s teams have a combined record of 46-3-1. 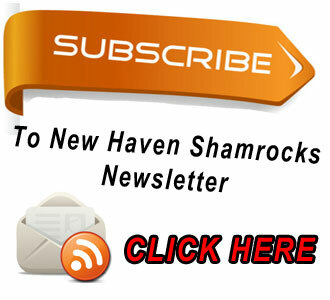 You can now watch the entire New Haven's Junior Varsity game, which includes interviews with the JV team along with Coach Denis Carey. 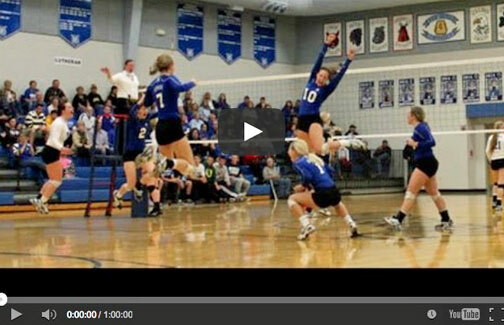 Varsity's three set thriller against Owensville will be available to watch once it is finished being processed. "El Perfecto" Junior Varsity goes undefeated, 24-0, 7-0, and with 2 set win over Owensville, 25-15, 25-9 were 49-3 in sets played. Complete story coming soon.